“The Official Travel Agency of Orlando Theme Park News“! We Specialize in Premium Research, Planning & Booking Services for All Disney Destinations! Destinations with Character Travel is a Full Service Travel Agency Specializing in Disney Vacations and providing clients with a Hassle Free & Stress Free vacation experience. We have clients ranging from Hollywood Magic Makers to New York Business Executives, to Midwest Families deciding to trust us every day with their vacation memories. While offering customized & personalized vacation services, to all destinations based on our client’s specific Needs and Desires, Our Work Ethic, Pride in our work, and Attention to Details are why the majority of our clients become Repeat Clients! Your time is valuable to you, so let our Travel Consultants handle the Research, Planning, and Booking needs for you, Saving Your Time for other important activities and giving you a “No Hassles, No Stress” vacation process, a Marvelous Vacation Package Deal, all while treating you like you are part of our family! We have no hidden fees, your down payments are only what the travel supplier requests, and all payments are made directly to the travel supplier for your safety as well as ours. For ALL of our Vacation Bookings we offer; FREE Concierge Level Services, FREE Expert Advice, FREE Planning, FREE Rate Monitoring Service, and a DEDICATED Travel Consultant available to you everyday from your first day of planning until the day you return home, available to handle whatever your needs may be. Additionally, for Disney Vacation Clients we offer FREE FastPass+ Reservation Services, and FREE Advanced Dining Reservation Services. Join Our Email List Below To Get Up To The Moment Promotions Delivered Right To Your Inbox! Your Time Is Valuable and Disney Vacations = Time & Planning. Free Up Your Valuable Time! “Destinations with Character Travel Agency” was founded by Tina & Don Korta in 2013. 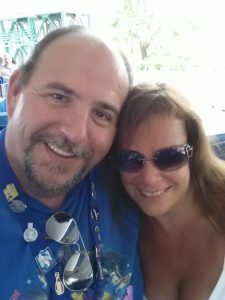 Based on a lifelong Love of Both Travel & Disney, they left the corporate world after almost 30 years working in IT, Group Management, Event Planning and a host of other duties to follow their dreams of providing premium travel services and options for clients. They share a love of travel and Disney of over 50 years, traveling across the United States, over seas, and cruises to various destinations and have shared that love with their 7 children and 4 grand children. They know and understand all of the complexities that go along with traveling with a large family, in groups, and multi-generational groups and now work to bring Magical Disney Vacations, Exciting Cruises, Relaxing Resort Vacations, and a host of other options to their clients, most of whom have become repeat clients for 3,4, and 5 trips, all within these few short years. Your family’s Magical Vacations and the Memories created are priceless, don’t just trust them to anyone. Why would you use a travel agency that just books your vacation and says, “Thanks for your business, please keep us in mind for future trip”? Use an agency that cares about you and your family the same way they would care for their own family. Your time is also valuable in this hectic age. Why spend all of your time researching, going over travel brochures and web sites, when that’s the job of your travel consultant? Give us your thoughts, ideas, and budget, and we will work with you to create the perfect vacation experience for you and your loved ones, giving you the most value and best experience for your budget! In less than 4 years Destinations with Character Travel has grown from a small husband and wife team selling Disney Vacation Packages, to a full service travel agency. While we Specialize in Exciting Cruises, Magical Disney Vacation Packages, and Relaxing Resort Vacations, including All-Inclusives, we also maintain one of the largest non-Disney travel portfolios, filled with travel options offered by only those vendors we have grown to trust, in order to offer you a full compliment of leisure and business travel options to suit your every need! Not only do Don and Tina personally have over 50 years of experience at Disney Parks along with personal, firsthand experience of over 85 % of the Disney Resorts and Dining Experiences, with Destinations with Character Travel, you have a “team” who will be there for you every single day, from the first day of planning until the day you return home! All of our travel consultants are all Graduates of the College of Disney Knowledge and must take annual update courses to refresh themselves with Disney Destinations. Along with Disney Training, our travel consultants are continuously training on aspects of our non-Disney offerings giving them the competitive edge and knowledge when planning your vacations. Our family of travel consultants have a variety of specialties in addition to their general knowledge. Specialists with the Disneyland Resort, Disneyland Good Neighbor Hotels, Walt Disney World Resort, Military Discounts, Family Groups, Large Groups, are just a small part of the special services Destinations with Character Travel brings to you. While you will have a “dedicated” travel consultant, all of our travel consultants also work as a team, constantly sharing knowledge and experiences to give all of our clients the best Vacation Experience possible. For Disney Vacations we offer FREE Rate Monitoring Service to get you the best price available. For Disney Vacation Packages we offer FREE Dining Reservations services. For Disney Vacations we offer FREE Fast Pass+ reservation services. Give you their personal advice (based on their years of experience and continual research) on resorts, restaurants, attractions and shows to best fit the needs and desires of your loved ones. Be available for you every day until the day you return home. Destinations with Character Travel Specializes in Disney Travel of all types. Walt Disney World Resort, Disneyland Resort, Hawaiian vacations at Disney’s Aulani, A Resort & Spa, the Disney Cruise Line for a superb collection of ocean cruise destinations for all ages, and Adventures by Disney where you can find exciting tours and adventures all over the world, not with Disney Characters, but with the Disney Signature of Excellence in in planning and guides. Not interested in Disney? No Worries! Destinations with Character Travel is a Full Service Agency with a large portfolio of travel options to fit all your dream vacation ideas! Amusement Parks – We offer rooms, tickets and package deals to the following major Amusement Park Destinations; The Disneyland Resort, The Walt Disney World Resort, Busch Gardens Parks, Discover Cove, SeaWorld & Aquatica Parks, Universal Parks & Resorts, Knott’s Berry Farm, and others..
Hotels – We can book your hotel stay at all major chains throughout the world are available to us through our use of not 1, but 3 major travel agencies booking engines to give you the best available pricing! You want someone you can TRUST with your family’s planning, trip, and memories, you want the experience, knowledgeable, and caring services of Destinations with Character Travel! Take advantage of the 50+ years of experience and knowledge that we and our family of travel consultants would love to share with you in helping to plan your next Vacation Experience! We can assist you with any of your vacation and travel needs, anywhere in the world! We come from all walks of life, just like our clients. This helps to give each and every client the personal touch, and an agent who will work with you and be available to you each and every day from the first day of planning right up until the day you return home. We make the difference by removing the stress and hassles that come along with planning a vacation by handling all of the important details that go into making a vacation more than just a vacation. Whether it be a Magical Disney Vacation, a warm Hawaiian vacation, a cruise to destinations worldwide, or something else, we have a travel consultant with just the right expertise to assist you!